As the media landscape continues to change across the country, more communities are finding themselves in news deserts, without the coverage where they once had thriving newspapers. Meanwhile, journalism students are looking to learn their craft and gain real-world experience. In Kansas, one community is close enough to campus for the two to partner to provide coverage and lessons in today’s media realities. University of Kansas students from the William Allen White School of Journalism & Mass Communications are providing news coverage for Eudora, a city of roughly 6,300 residents about 10 miles from campus. The project began as a way to give students social media experience with a professional client and has grown into a news site providing coverage of events, local businesses, sports teams, schools and people. Teri Finneman, assistant professor of journalism, is leading the project. In previous teaching experiences, she had students conduct social media management projects for clients. She asked to work with Eudora’s Convention and Visitor’s Bureau to revamp the page Eudora Events after learning that the community no longer had a local newspaper. “I couldn’t believe it. I immediately decided I wanted to do something about it, so I ended up reaching out to the city to see what we could do to get something off the ground,” Finneman said. The result has been students in both social media and reporting classes providing coverage through the aforementioned Facebook page and a newly launched Eudora Times news site. 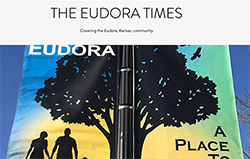 When the social media class began overseeing the Eudora Events page in the fall, numbers of likes, shares and other metrics increased. The class has written and published features on local businesses such as a new coffeehouse and food truck specializing in desserts; school events, including a class building a house in the community and students traveling to Ecuador to learn about conservation; and community topics such as a fundraising campaign for a new library and the local Scout troop’s anniversary. The pieces are all featured on both the site and Facebook. Nearly 1,000 people have liked the page, and others receive push notifications when new content is published. Every story includes photography, video or other multimedia. While the project is part of a class, students said it’s meant more than turning in an assignment for a grade. Riley Wilson, a reporting student, said the idea of covering Eudora reminded her of her hometown of Wamego. While the project started as a class trying its hand with social media management for a client, the positive reception and success have led to discussions on how it could be expanded. Finneman said she hopes to bring on more students and expand coverage into city government and other areas while simultaneously providing unique real-world learning opportunities. Community newspapers can provide a record of what’s happening and insight into local governance. A loss of local coverage can lead to a lack of news literacy, which can contribute to distrust of media, fostering a negative climate in which news is distrusted or considered “fake news,” and uncertainty of which news sources are legitimate, Finneman said. A community-university partnership can address those issues and be beneficial to both parties. Journalism professors have always encouraged their students to get out of the classroom and off campus to learn how to tell stories, meet sources and hone their craft. As more newspapers fold, that has led to increased opportunities for students to get that learning experience while also seeing the realities of the media industry.